Have you seen the epic John Lewis Christmas TV commercial? The one with the haunting soundtrack (a cover of Your Song by Ellie Goulding). It is very atmospheric, making you really feel warm and look forward to a present-filled, idyllic, family-based Christmas - right up to the moment when you see the family dog - a Deerhound - lying in the snow, outside a ramshackle, bare shed - ironically clad in festive fairy lights. No door, no raised bed. How very unChristmassy to glamorise neglect! It makes keeping a dog outside in all weathers appear almost aspirational. And who'd have thought this imagery would come from such a normally ethical, animal friendly company? That final scene totally ruins the advert for most dog lovers. We're not stupid, we know it's not real. Of course the dog doesn't live there really. That the snow is probably fake. But the illusion makes putting a dog in an open-to-the-elements shed seem acceptable, even normal - in fact actually quite posh! It validates something people should feel very, very uncomfortable about doing. In the real world, if your neighbour kept their dog like this dog the RSPCA would be interested. It would probably constitute a breach of the new Animal Welfare Act. A few days ago dog lovers were tricked into believing that John Lewis had listened to the complaints from their customers and welfare charities like Battersea Dogs Home, Dogs Trust etc. Even the Telegraph and the BBC were fooled. But it turns out John Lewis has not agreed to stop showing the 60 second advert uncensored. They intend to show it prime time this weekend against top rating shows like Xfactor etc and through to December 18th whenever they feel like it. And they have been copying and pasting answers to customers. They really are not listening. All we need is for them to stop showing this advert with this ending. To re-edit. They will ask you when exactly you saw the advert. Here are some recent showings just in case you haven't recorded the channel and time. It is being shown very frequently. Please join the facebook page (almost 2,000 followers in a few days) and post your opinion on the John Lewis facebook page, too. Complaints have been made to ASA by 5 members of my family hope they listen. The RSPCA have still said nothing!! I am also going to complain to RSPCA maybe more voices complaining and the RSPCA may step up. Just seen the short version during X Factor break. RESULT! Of sorts. Beverley, do you why the facebook campaign has been closed? Went to look at it this morning and it's gone. Has it been removed by FB - or just a John Lewis sponsored technological hiccup!? Or maybe JL have changed their stance... a lot to hope for, I know. Facebook site back up now everyone! Sorry couldn't answer before - that Harry Potter movie goes on for hours...! 5:28pm full advert shown on ITV just before the HP: Behind the magic. Thanks for highlighting the issue and the helpful link to the ASA website. We owe it to our dogs to provide them with shelter, warmth and company as a minimum. In my work as a puppy trainer I see many rescue dogs who have have suffered the lasting effects of neglect so lets hope JL take notice! I see the Dog Trust has released a new statement stating thay they have written to JL yet still NOTHING from the RSPCA!! Just shows who realy care's about dog welfare. It amazes me that yet again we are have another organisation behaving irresponsibly by including a dog in their advertising campaign. Last year Heat magazine, stupidly, published an article entitled "All I want for Christmas" in which celebrities said what they wanted for Christmas and Heat told them/us where to buy it. Alexandra Burke said she wanted a Bichon so Heat directed her/the reader to website which is well known for having adverts placed by puppy farmers! 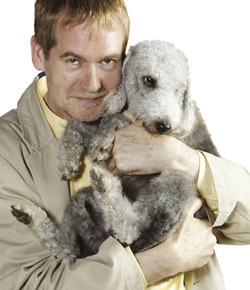 They showed a picture of a Bichon puppy with the words "Bichon @ [website address] from £500" as though it was a toy. Heat were sent lots of emails from angry dog owners but they couldn't be bothered to even respond. I don't think they thought encouraging the purchase of a puppy as a Christmas present was doing anything wrong (despite being told in detail why it was). Why do these organisations continually make these huge blunders? They seem incapable of seeing the bigger picture and the impact their decision to include an animal causes. As far as the RSPCA are concerned I am not surprised one bit.